Decorating for our first Christmas! 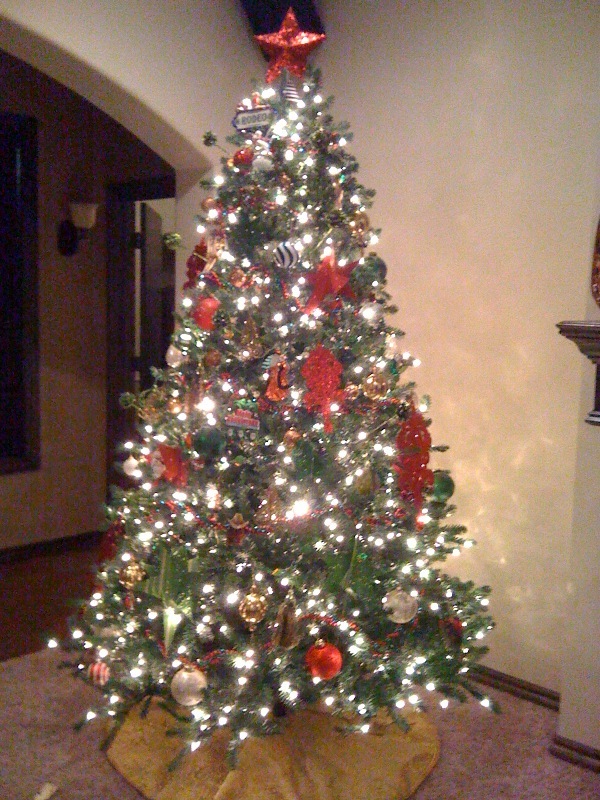 Bryan and I had so much fun decorating our first “married” tree! We are pretty proud of how it turned out. I tested my skills at wreath making for the front door and the garage lights. My mom has always been the wizard at making wreaths. A trip to Hobby Lobby and a few hours later I had a some very pretty wreaths! We also had our annual trip to Lowe’s and got a cool mini tree for the porch. I can’t believe Christmas is in four weeks. This past weekend our family experienced yet another wedding, but this time it was even more sweet. My little brother, although almost 27, got married to Mary Cathryn Harris at All Souls church in Oklahoma City followed by a wonderful reception at the Petroleum Club downtown. Even though I have been in ten other weddings, this one was very different because he is my only sibling. During the ceremony I was captivated watching my brother look at his bride. They are really crazy about each other for sure. The ceremony was a tad unorthodox and the minister a little loopy, but it was surely comic relief to say the least. She looked beautiful in a gorgeous lace gown and champagne sash. We danced to a cool band named C +, which Bryan and Cathryn decided to book for the Hansen-Coy Christmas Party. Fortunately, I don’t think that the band will remember them securing the date after many celebratory beverages. hehe. It was also the first time my name was listed on a program as a matron and not a maid. Quite a step up for me in the world. Bryan was a groomsman as well. I thought it would be cute to lean over during the ceremony and mouth to Bryan that I loved him. Funny was the fact that Grant’s best man Wes caught that instead of Bryan 🙂 Luckily, we are all becoming fast friends through this! It was a great weekend filled with thoughts of our growing family and future great events. I wish they could take me in their suitcase on their honeymoon to the Dominican Republic tomorrow! Gaining new family is such a blessing. Thank you God for a wonderful past few months for our families to celebrate together. Congrats Grant and Cathryn, we love you very much!